These refreshing peppermint balls or patties are a great gluten and egg free dessert or snack. They can be easily made dairy and soy free too. Just use Spectrum shortening, Earth Balance Soy Free Margarine, and Enjoy Life Brand chocolate chips. A powdered milk substitute works best to replace evaporated milk, as it can be made thicker. I like Dari-Free, which is potato based. In a medium bowl, combine the butter or margarine, vanilla extract, and peppermint extract. Stir until well blended. Then add the first 4 cups of confectioner's sugar, stirring until it is incorporated as much as possible. Add half of the milk or milk substitute. Stir again until all is smooth and wet. Add the rest of the milk. Now, depending on how stiff you want the filling, add another half cup of confectioner's sugar and work it in. You might need to use your hands, or baking gloves work well. If you want it stiffer than the photo (which was 4 1/2 cups total) then work in the remaining half cup of confectioner's sugar. 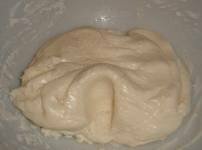 It should be about the consistency of play dough or stiffer. Form the filling into one inch balls, and place them on a sheet of waxed paper that is on a cookie sheet. Once you've made all the balls, refrigerate them for about 30 or 40 minutes. 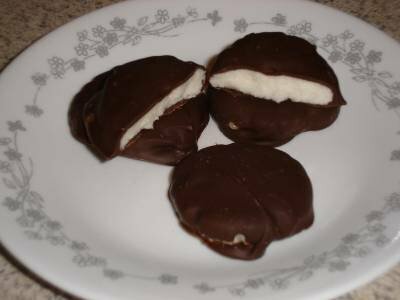 You can dip them in the melted chocolate at this point if you want to make peppermint balls. For patties, take a glass and press the balls to 1/4 inch thickness. When you've pressed them all, chill again in the refrigerator for at least 20 minutes. During this time you can melt the chocolate and shortening together. Let the chocolate cool for a few minutes before dipping patties or balls into it, or they will loose their shape. I use a chocolate melter, but you can use a double boiler or the microwave to melt your chocolate and shortening mixture. Place the dipped balls or patties back onto the waxed paper on the cookie sheet. When all have been dipped, put them back into the refrigerator to set. It will take at least 30 minutes for the chocolate to lose it's shine and become set. At this point you can place them into an airtight container, or use bags. Keep them refrigerated. This should make at least 25-30.